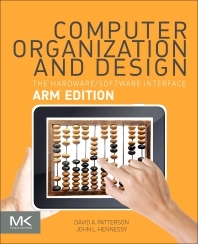 With the post-PC era now upon us, Computer Organization and Design moves forward to explore this generational change with examples, exercises, and material highlighting the emergence of mobile computing and the Cloud. Updated content featuring tablet computers, Cloud infrastructure, and the ARM (mobile computing devices) and x86 (cloud computing) architectures is included. An online companion Web site provides links to a free version of the DS-5 Community Edition (a free professional quality tool chain developed by ARM), as well as additional advanced content for further study, appendices, glossary, references, and recommended reading. Discusses and highlights the "Eight Great Ideas" of computer architecture: Performance via Parallelism; Performance via Pipelining; Performance via Prediction; Design for Moore's Law; Hierarchy of Memories; Abstraction to Simplify Design; Make the Common Case Fast; and Dependability via Redundancy. Undergraduate students in computer science, computer engineering and electrical engineering courses in computer organization/architecture or computer design (ranging from sophomore required courses to senior elective). Professional digital system designers, programmers, application developers, and system software developers.